Music is a joyful and meaningful part of our worship services—from traditional hymns to jazz, chancel choir to children’s choir, organ and piano to bells, and more. 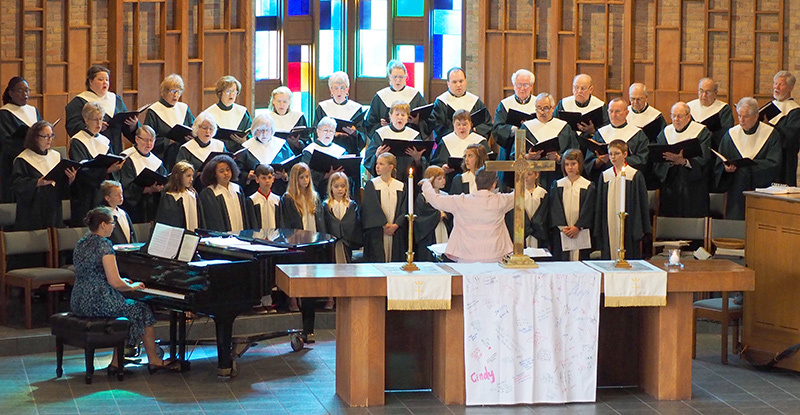 The Chancel Choir thrives as the main presenting ensemble of the church, singing an anthem and other music weekly. Twice each year, the choir presents a major work or a collection of pieces in an extended service of music. Any questions or concerns may be sent to Susan Stinson, Bell Choir and Chancel Choir Director. The Celebration Ringers, UUMC’s bell choir, ring on the third Sunday of each month. The Children’s Choir presents an anthem in worship one Sunday of each month and on special occasions throughout the school year.Children age 5 (reading) through fifth grade are welcome. Any questions or concerns may be directed to Connie Gamage, Organist, Director of Music and Director of the Children’s Choir.